Forget the white dress and suit - comedian Jason Goliath and his bride chose to tie the knot in a pair of jeans! We all know how expensive wedding attire can be. Apart from the high cost, choosing the right gown and suit can also be challenging. Now, imagine getting married and not having to worry about any of this? That’s exactly what comedian Jason Goliath and his wife, Sian Bailey, decided to do. 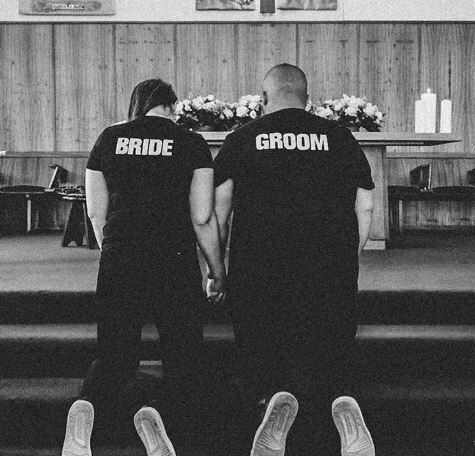 The couple tied the knot in an intimate wedding at Roodepoort, Johannesburg, on Tuesday wearing black jeans, takkies and matching “Bride and Groom” t-shirts. How is that for simplicity at its best. As if that was not ‘funny’ enough, the couple decided to ditch the traditional wedding menu and reception. They held their reception at the Wimpy restaurant at OR Tambo Airport, where they fed their guests Wimpy burgers, champagne and a wedding cake. How cute! According to IOL, the two left for a secret destination honeymoon after the reception. Below are pictures of the wedding.